We have two excellent flooring offers for our customers this January, on two on-trend, current styles. We appreciate you might not want to have a new floor installed quite yet, but you can still take advantage of the offers and book an installation for later on in the year. To secure your new floor at the discount price, all we ask is that you book your free flooring estimate and pay the deposit for the job, in January. 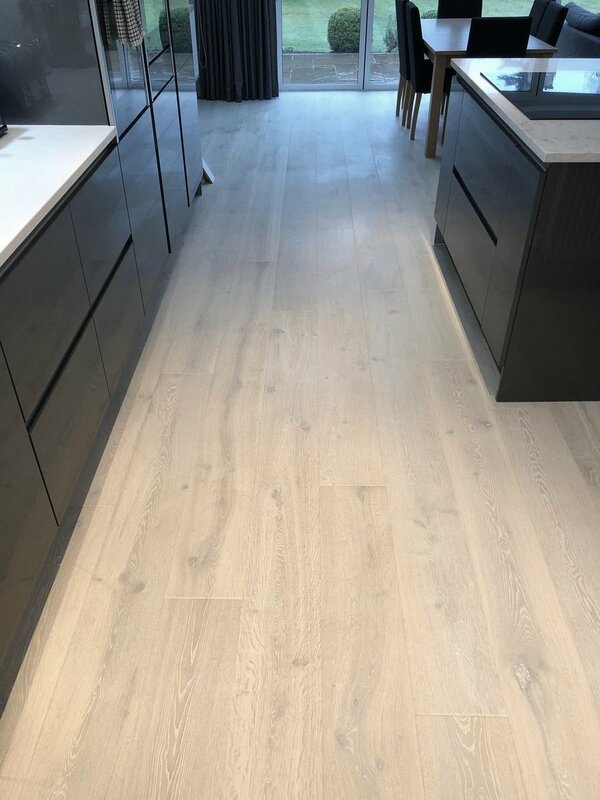 This modern engineered hardwood plank has been really popular in recent months and we've installed it in a couple of kitchens across the Cheshire region. The wood has a light tone and a lovely swirling grain throuhgout - it looks great against very modern, contemporary kitchen units. For the month of January, we are reducing the price per square metre of this plank from £69.99m2 to £58.99m2 - a saving of over £10m2, , and if you compare this to the RRP, it's an even greater saving! Features the moisture-repellent Surface & Edge Protect+ technology to help prevent mud, spilled foods and other dirt from getting stuck in the joints and texture of the wood. This helps to keep your floor looking as good as new. 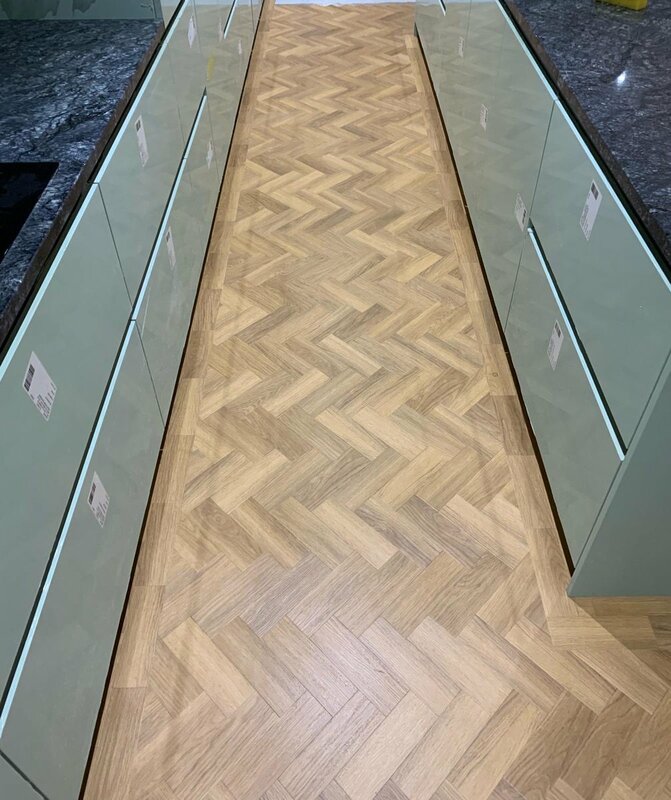 Luxury vinyl as well as parquet patterened floors continue to be very popular in homes across the region. We've installed plenty of both over the last few months. And to help more people get a must-have floor for 2019, we have reduced the price per square metre of ALL flooring in the Amtico Spacia collection, which includes a choice of wood, stone and abstract styles as much as options for parquet laying patterns. The pricer per square metre has been reduced from £39.99m2 to £34.99m2. It's a great starting point for designing the floor of your dreams - there are x48 woods - 12 of which are available in parquet format, x27 stone effect styles and x29 abstract patterns to choose from. And if you're looking for a floor that offers maximum practicality - being robust, tough and easy to look after, Amtico Spacia is ideal. Showing: Amtico Spacia in Honey Oak, laid to a parquet pattern with a two block border perimeter to this kitchen at a home in Bowdon. To get started with your new floor for 2019, and take advantage of one of our special offers, book your free flooring estimate with us today! Either send us your details via the enquiry form or give us a call at one of our showrooms. You can also see more of our work and get more inspiration for your new floor by browsing our latest work here.